Brighten-up your festive collection with this green foil print suit set. It comprises a straight fit foil print kurta, contrasting palazzo in same print and dupatta matching to the palazzo. 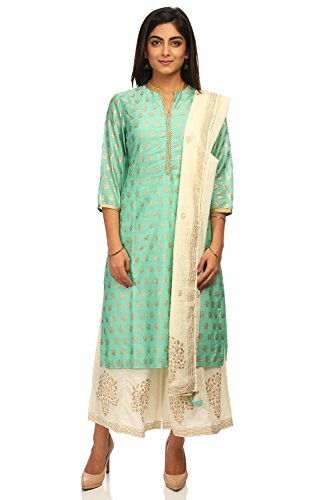 Kurta features smart neckline and sleeves with golden taping, placket with golden piping and embroidery and dupatta with foil print and tassels. Combine with mid-heel sandals and golden earrings for a perfect match.